Once upon a time I used to be a morning person, this was when I was in school and got up at 5 am everyday. Once I no longer had to wake up with the birds I got in the bad habit of sleeping in late. I used to wake up anywhere from Noon to 2 pm and feel just really foggy and not awake at all. Since I moved to CA my boyfriend gets up really early and usually comes in and wakes me up in the most annoying and obnoxious way. This is where the Wake Up Light comes in, I did some research into it and was pretty impressed, I decided to give a try and anything is better than my bf coming in and jumping on me. 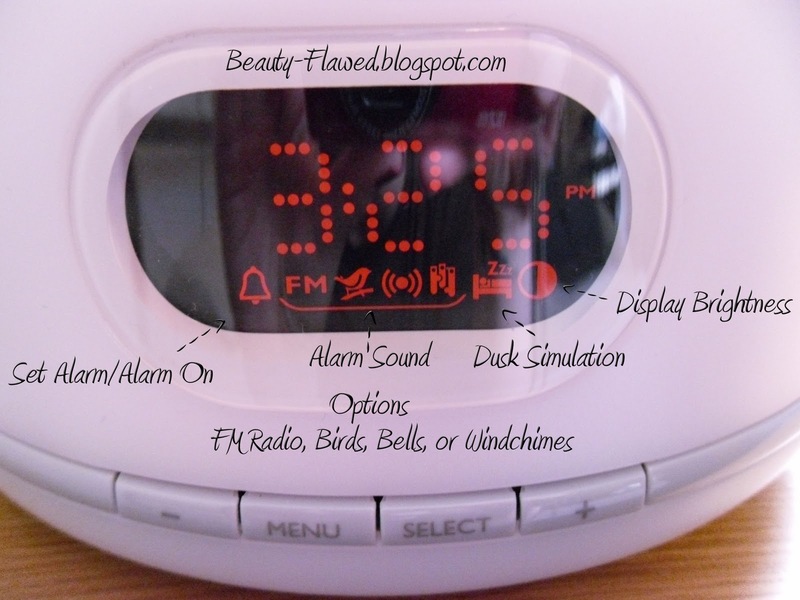 I picked up the sort of middle model (HF3471) this one includes a Dawn and Dusk simulation, FM Radio, 1-20 brightness settings, and 4 choices of sounds to wake up to (FM radio, Birds, Bells, or Windchimes). It also can be used as a bedside table lamp and has a replaceable halogen bulb. This is not your ordinary alarm clock that's for sure. There are a few other versions with different tweaks to them better sounds, more alarm options like using your own MP3's from a USB stick, bigger unit, or even one you can use your Iphone/Ipod with. Not sure if it will charge your Iphone/Ipod while its using it tho since I don't have that model. Here is a video that you can check out to get a better idea of what it is that the wake up light does. Waking up naturally to light is better than waking up to a loud and sudden BEEP BEEP sound. It creates a sunrise affect over a 30 min period and then the alarm sounds comes on gently for the first few seconds and then increases to it's set volume. I really like this wake up light I don't know why I didn't get this sooner. 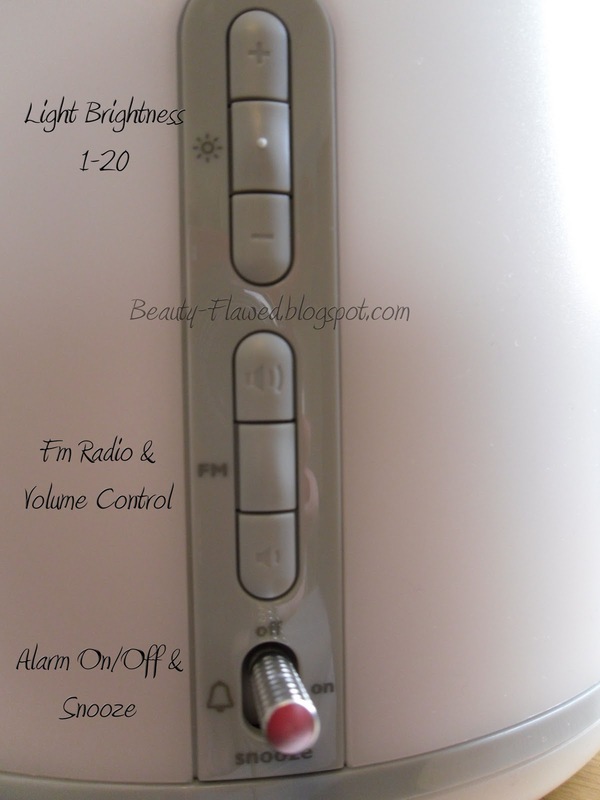 Its easy to use and its a lot better waking up to light than to sudden loud noises. I find that the light brings me out of that deep sleep state and into one that is lighter and almost aware that its becoming time to get out of bed. When I hear the alarm sounds gently kick on its a lot easier to get up and to resist hitting the snooze button (even tho I do still do that on occasion lol). I also use the dusk simulation on nights that I'm having trouble sleeping, you can set the dusk simulation for 15 mins - 1hr 30 mins. 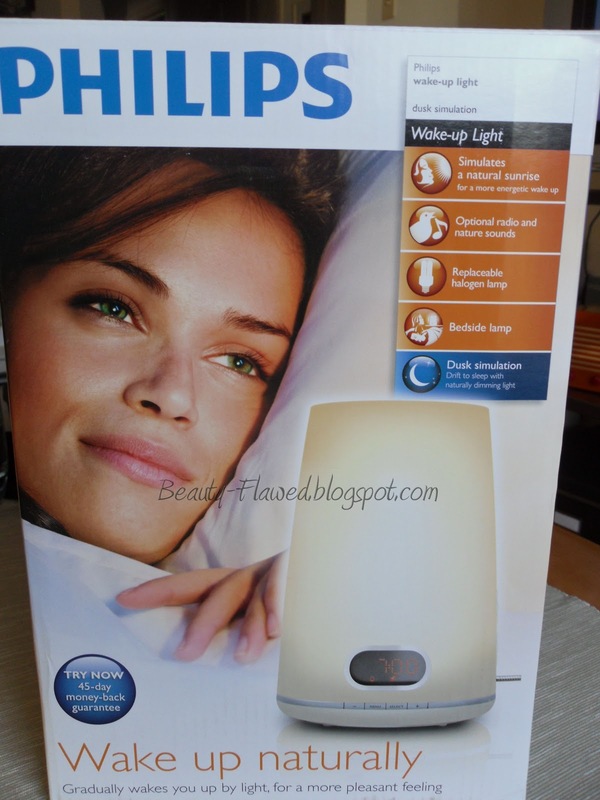 I just use the 15 min one and it really makes the difference when I'm having a bit of insomnia, its like the light actually makes me tired watching it turn off. 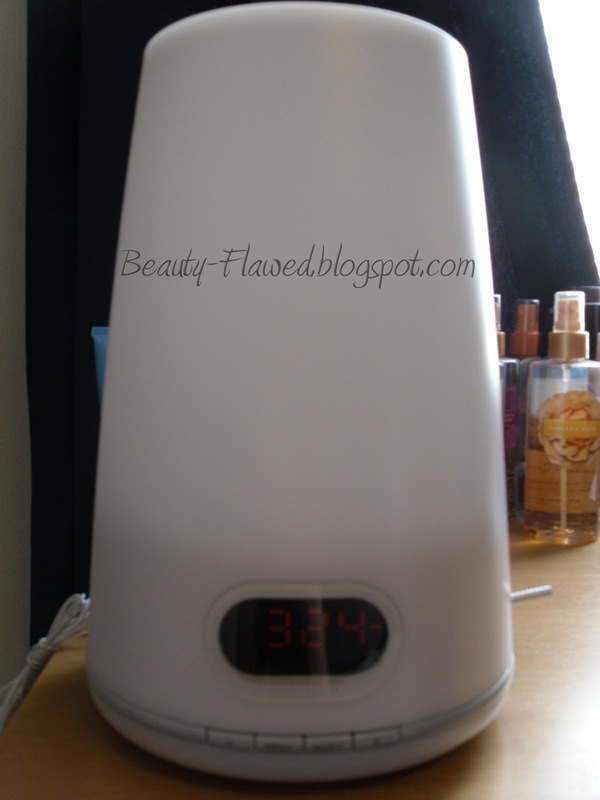 It uses a Halogen bulb, so far it's been great but it does get pretty hot after about 30-45 mins but I don't think its enough to burn the skin as long as your careful. The bulb is replaceable I searched online and could only find amazon sources for it, not sure how available it will be locally but I guess I'll figure that out when the time comes. On Amazon they are anywhere from $4-$6 dollars right now for one replacement bulb (Philips Halogen lamp, 100W, 12V, GY6.35). I didn't want to make this post too picture or video heavy so I did not record the light in action but again if you check out the Phillips video of this alarm clock fooling a rooster you'll see how it works. Some things I'm not wild about when it comes to this light are its large size. When I first got it I was thinking there was a lot of protective packaging because the box was huge. Nope the light really is just that big it measures about 10 inches tall 7 1/2 inches wide and 19 inches around its middle. I didn't have the best tape measure handy so these could be slightly off. Another minor issue I found is that the light starts to turn on 30 mins before your alarm time goes off so say you need to get up at 8 it starts at 7:30 and at about 7:45 I find myself noticing the light and waking up a bit sooner than needed. I have learned to tweak this and set the alarm for about 10 mins after I need to wake up and for me this has been working well I'm up slightly before the time I need to wake up and not waking up late but still getting that extra bit of sleep. Another minor tiff is that it does not have any radio presets so you pretty much get the on channel or you have to manually surf every time you want to change it with no easy way of going back. I picked up this model on Amazon for $99.99, so it is a bit pricey but for me it's so worth every penny since I can actually get up at a normal time and not feel like I'm in a fog. If something ever goes wrong with this one and I end up having to spring for a new one I think I would go ahead and just get their very best model with all the bells and whistles because I really do like it so much. If your not a morning person I would really suggest giving this a try it has worked wonders for me and I'm really impressed by it. Yes it a little on the pricey side I think the lowest price one is around $89 on Amazon for the basic model but its worth it to be able to wake up and feel good. August 2017 update: This thing is still going strong and one of the best purchases I've ever made! I've been thinking on getting one of these, heard they work really well! In the winter it's really dark here where I live and some extra light would be amazing :) If only they weren't so expensive. No freaking way! That video was really enlightening! I HATE waking up early in the morning... this would make things so much easier for me! This is soo cool!!! I want to try one! I hate mornings and my annoying alarm clock on my phone doesn't help!